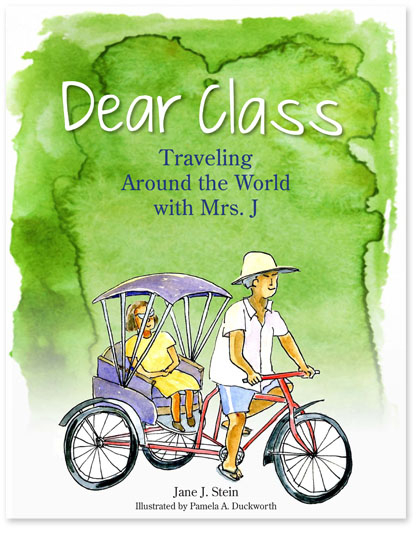 Delighted to announce my friend Jane Stein’s children’s book, Dear Class: Traveling Around the World with Mrs. J., with charming illustrations by Pamela Duckworth, has been published and is available for ordering online. The book is about a teacher who visits more than a dozen countries in an amazing six-month trip. It’s based on the travel log of the real Mrs. J, who took this trip in 1963. Readers learn about her adventures through the letters she writes her students, reproduced in the book. Sidebars include historical information, updates, fun facts, websites, and activities. Written for children ages 8 to 12, Jane says, the book is the story of living out a dream—in this case, to travel around the world–and having the adventurous spirit to do it alone. During the course of her adventures, Mrs. J studies at the Sorbonne, visits a school in Istanbul, lives on a houseboat in India, and more. She sets out to learn about people, places, food, art, and the culture in countries around the world. While she does that, she also learns a lot about herself. Here’s an excerpt from the first chapter. Order for your kids, grandkids, kids of friends, and reward this imaginative, fun project! Good work, Jane!! This entry was posted in The Morgue, Travel and tagged children's books by Victoria. Bookmark the permalink.